The EX4500 is no spring chicken, having been introduced in May 2010 as part of Juniper's data center switching strategy. This is a 2RU product that has 40 built in 1G/10G SFP+ ports with expansion slots to add 8 additional SFP+ ports. Juniper says nothing about packet memory for this switch, but it was swept up in Tolly report 211108. A 2014 post about juniper switch buffers is in addition to Tolly's empirical number. Announced in Fall 2012, the EX4550 is the product-line successor to the 4500. 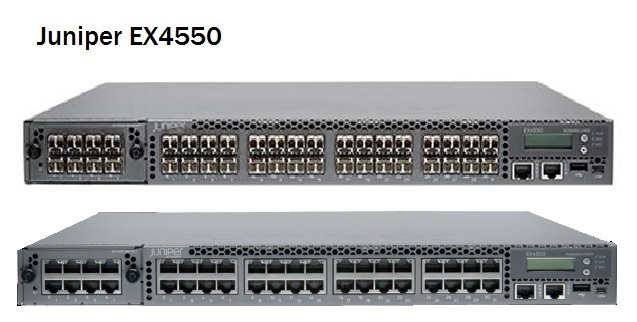 First mention of a 4500 switch in customer hands on the j-nsp mail list is Februrary 2013 in response to a question asked the previous month. From the discussions, it appears that the EX4550 does not do cut-thru switching and that makes shared buffer utilization somewhat less effective than it might otherwise be. The 4550 is a 1-RU top-of-rack switch. From specs, I suspect that that the 4550 and 4500 use the same ASIC silicon. There are four base variants. Front-to-back and back-to-front air flow; 10 GbaseT and SFP+. The expansion module on the left side is also available in interface configurations that include QSFP (not pictured). Juniper does not talk about packet memory in the switch data sheet and here Tolly has not come to the rescue. According to a 2010 NANOG presentation, Juniper Ex-series switches use Marvell silicon. At the time this was written, the Ex4600 had not yet been released.